Buckwheat, despite the name, is not related to wheat or cereal at all but rather is in the same family as sorrel and rhubarb. This grain is no longer a commercially important cash crop in the US but remains a staple in eastern Europe. Increased use of commercial nitrogen fertilization which enabled farmers to grow wheat and corn crops more effectively pushed out buckwheat as a cash crop in the US. Russia remains the world’s largest producer of buckwheat followed by China. 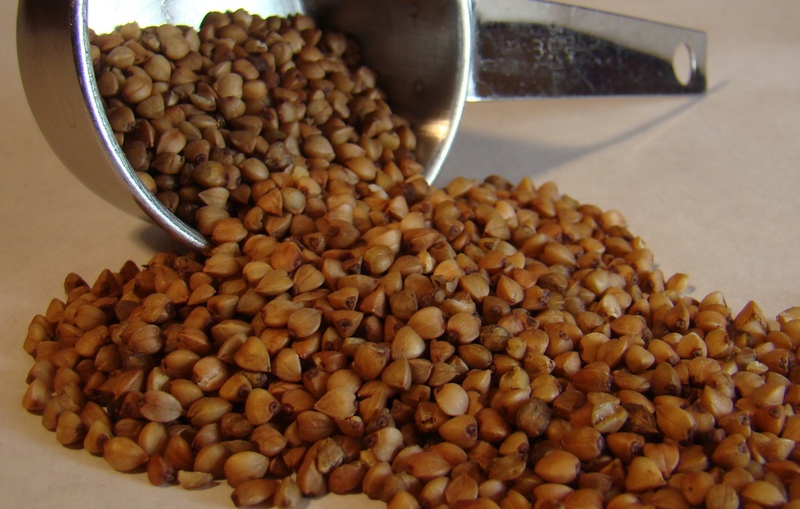 Buckwheat kernels are small triangular shaped seeds. Click on the picture for a closer look. Buckwheat while starchy, is also high in protein (for a grain) as well as iron. What’s not to like? Oh, and it’s also gluten-free! Buckwheat is flexible in that it is can be prepared sweet or savory. I’m just getting turned on to buckwheat and I have to say, alongside bulgar wheat, it may be new my favorite grain. Nutty, filling and with a great chew, it is earning a place in my pantry. I can’t wait for the garden produce to make delicious cool grain salads this summer. But for now, snow is on the ground and smoke is rising from the chimneys. Today I want something warm and satisfying yet healthful for dinner. Kasha in English generally refers to buckwheat groats or toasted buckwheat, but the term in Slavic languages is a rather generic term for porridge that may or may not include buckwheat. Kasha Varnishkes comes to us from Russian Jewish immigrants. 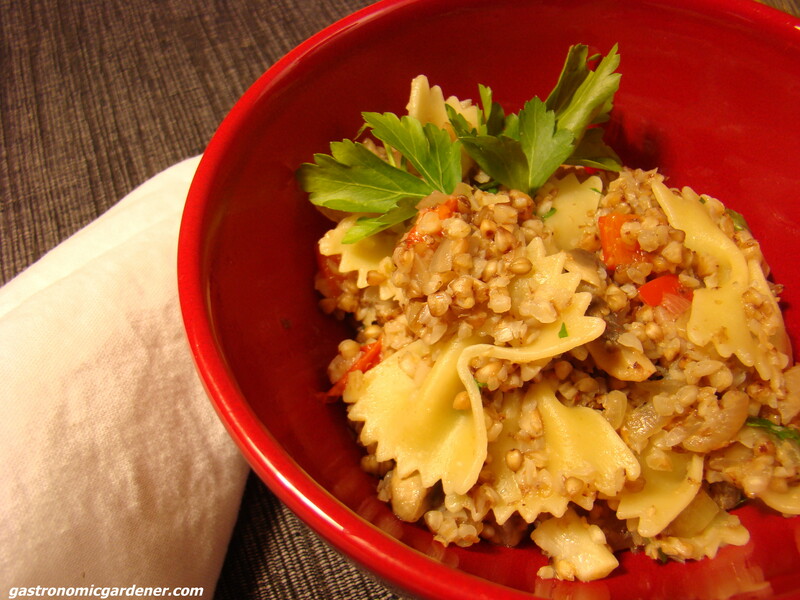 Based on delicious nutty buckwheat and bow tie pasta (Farfalle) – this Jewish comfort food is traditionally made with buckwheat, egg, onion, chicken fat, and chicken stock mixed with the pasta. I’ve adapted this dish for Meatless Monday, so while not “authentic” per se, it is a delicious dish that, accompanied by a green salad makes for a complete dinner that can be on your table in less than 30 minutes. Put water on to boil the pasta (add salt if desired, I always salt water for pasta). 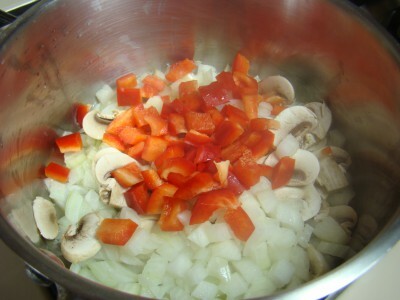 Over medium heat add the oil, and heat till hot, then add the onions, mushrooms, and sweet peppers. Cook stirring occasionally until tender and just starting to brown. Add buckwheat and stir to coat with oil, add water (or broth) stir and cover. 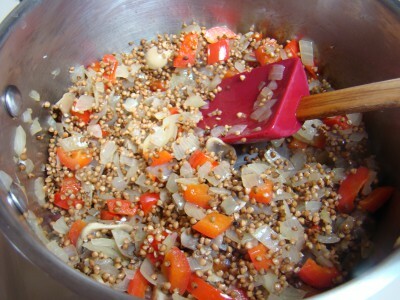 Reduce heat and cook until tender about 10-15 minutes, stir occasionally to keep buckwheat from sticking. Cook until almost all moisture is absorbed. Check seasoning and adjust salt and pepper as desired. 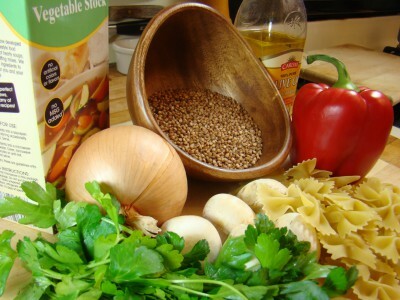 While buckwheat cooks – add the pasta to the boiling water and cook until just tender. Drain the pasta and stir into the cooked buckwheat vegetable mixture. If buckwheat is not part of your staple grains, I suggest you give it a try! I’ve only encountered Buckwheat made into pancakes – e.g. the “Sarrasins” so favoured in the south of France. Over here it has a bit of a poor image – perhaps overly “good for you” and a bit cranky, which is entirely unjustified. Unjustified indeed! I think diced in season tomatoes and cucumbers a bit of chilli and a nice acid dressing together with some cooked buckwheat, served chilled would be a wonderful side for any summer meal. Or a meal unto itself! How interesting…I’ve not used buckwheat and appreciate your providing some good info on it. This really looks good and if you’re making this a part of your pantry stash then I definitely need to look into this!! Linda, I think it does belong as a pantry staple, as with any grain the flexibility is there. I can see it in a Tabouleh type salad, added to soup in place of barley, as a pilaf with a ton of small diced sauteed veggies. Of course the flour is popularly used in pancakes. Even simply cooked with a pat of butter on top and dash of salt would be good. This is completely new to me, David, but, I must say, you’ve piqued my interest. As the gentleman before me stated, I’d only heard of buckwheat used in pancakes and knew nothing at all beyond that. Thanks, I really enjoy checking out new foods and flavors. Always good to find something new John. It has a distinctive taste that while perhaps not for everyone, I enjoy. The fact that it is healthful is just a bonus! Now that looks one to try… Like others, I have only really come across buckwheat in pancakes and I do love Gallettes de Sarrasin-especially the ones with spinach, crème fraiche and an egg! Must add buckwheat groats to the shopping list now and give your dish a go. Many thanks David! Nice! I grew up in New York City oh too many years ago, and I miss Cafe Kiev. I am now vegan, and this looks so simple! Thanks for the vegan variation! Any ideas for pieroshki? Great website, thanks so much. I’ll take that as a compliment Maria! Have never made pieroshki but it is on the list! That was a compliment, in fact. I made the recipe tonight and it’s really yummy! Comfort food, for sure. The family chowed down!